The mystical and iconic sitar has tugged at our heart strings over centuries and across the globe. The stirring sounds of the sitar have had tremendous musical influence through time and place, from its lilting melodies in the courts of India’s kings to its infusion in contemporary and world music genres. 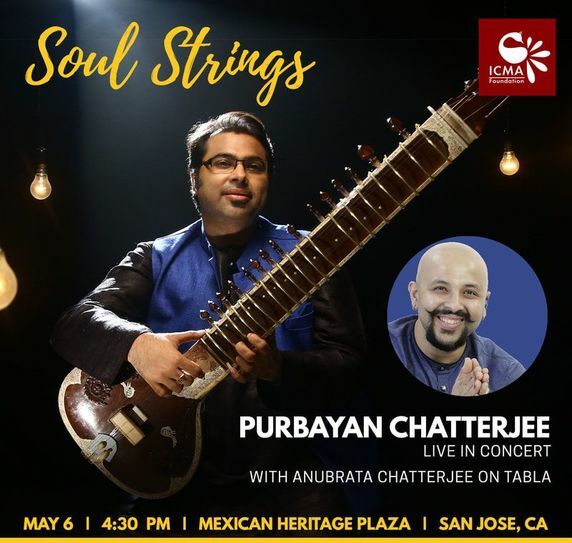 ICMA Foundation invites you to “Soul Strings” - an evening of soul-stirring music presented by Purbayan Chatterjee, the young sitar virtuoso dominating today’s global Indian Classical music stage. Purbayan's multi-faceted musicianship enables him to seamlessly transition between his soulful Indian classical renditions to genres like jazz and rock music. Purbayan belongs to the Senia Maihar Gharana founded by Ustad Allauddin Khan and he carries the rich legacy of sitar maestro Pandit Nikhil Banerjee. Purbayan also holds the distinct honor of contemporizing this ancient instrument through his “See-tar” series. After having received the President of India Award for Best Instrumentalist in India at the age of 15, Purbayan has been enchanting worldwide audiences for over 25 years. He will be accompanied on tabla by Anubrata Chatterjee, son of tabla maestro Pandit Anindo Chatterjee. Anubrata is a renowned soloist and accompanist who has played with many living legends of Indian Classical Music. Purbayan and Anubrata often share the stage and have also collaborated on contemporary musical endeavors. Whether this is your first time at an Indian Classical music concert or you are a seasoned aficionado, come prepared for an unforgettable journey of soul-stirring music complete with intricate rhythms, evocative melodies, and enchanting reverberations sure to delight! musical immersion opportunity to complement any course of musical study. We are fortunate to live in a diverse community like the Bay Area, and our youth - equipped with their musical education and as much exposure as we can give them to great artists and musical role models - are in a distinct position to deepen that vibrancy and promote cross-cultural understanding in our community at large. This is a pillar of our mission as an organization and we hope students take advantage of this unique program. Student ticket is $10 for any seating level. Students will sit in the same level as their parents/group. If bought separately, student tickets are in Level III. Significantly subsidized tickets available for students under 18. ​If you have any questions or would like to purchase bulk tickets in excess of 20, please email us at tickets@icmafoundation.org. Cancellation policy: All sales are final. No refunds.